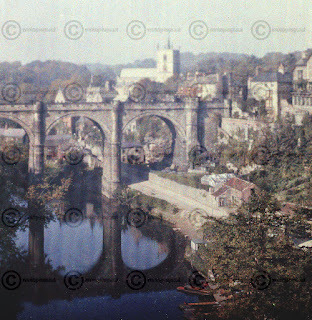 In one of the earliest colour images in my collection, Knaresborough in Yorkshire is seen here in an Autochrome glass plate taken in 1913, only six years after colour photography became easily available in 1907. It is typical of Autochromes in rendering colours in pastel shades rather than the vibrant colours we expect today. But Autochromes of towns are rare as most, due to the long exposure times, were of static and colourful subjects. 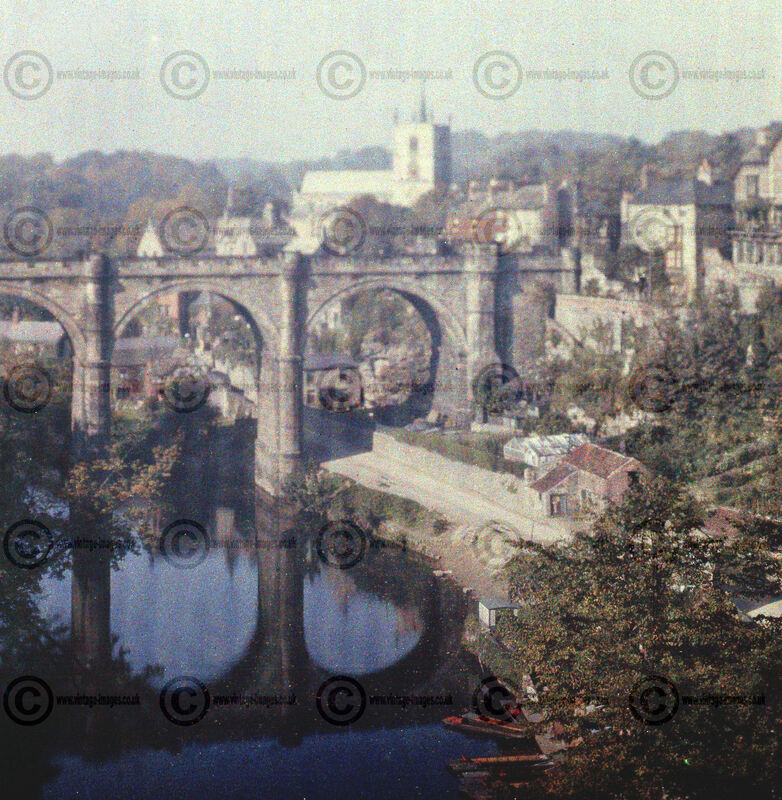 The image is taken from the ruins of Knaresborough Castle and surprisingly for an image taken a century ago, very little has really changed in what you can see here. The trees now almost obscure the church of St John the Baptist and the railway bridge still carries trains across the River Nidd. Waterside is the street running below the bridge but what appears to be the gardens of a house to the right of the road now has houses built there. Google Map street view is a wonderful thing and these houses were being constructed in 2008 when the Google camera car tootled along Waterside. Just under the bridge what may in 1913 have been a house is still there, but new houses have again been constructed in the gardens. The riverbank has also been extended to the outer edge of the bridge pier and finished in concrete. Not much has changed here in the past century - and that is not something you can say about many of the images that you will see on this blog!